BANGI, 7 October 2014 – The National University of Malaysia (UKM) has been given the thumbs up by the Education Ministry (MoE) for its programmes to encourage the learning of Science, Technology, Engineering and Mathematics (STEM) among youths. 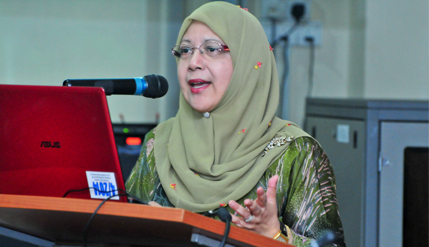 Higher Education Director-General Professor Datuk Dr Asma Ismail said UKM has taken the lead among public universities in meeting the challenges in bridging the STEM gap. The widening gap in STEM studies can be seen in the declining enrolment of science students at the secondary school level. Prof Asma, the first woman to be appointed to the post, said the decline has also brought about the lack of critical thinking skills among the youths in the country. She was giving a public lecture on Science and Nation-Building: The STEM Gap as part of the Ungku Omar series of lectures organised by the Faculty of Science and Technology (FST) in conjunction with its open day here today. She said the ministry had noticed increasing inability of secondary school students to connect STEM methods to real-life problems despite efforts to encourage critical thinking. This has been carried forward to the tertiary level. “We do not want the students to learn about electrons and yet not been able to connect it with the functions of television. We also cannot have students learn about biology but cannot connect it with teenage pregnancy,” she said. She noted that UKM had implemented several programmes that fostered interest in STEM at an early level, such as the Nobel Laureate-in-Residence and the Nobelist Mindset. UKM is the only local public university to have such programmes. Prof Asma praised UKM for carrying out the Young Scientist Summer Camp at the New York Academy of Sciences to give form five students the opportunity to find out more about innovations and entrepreneurship. She also congratulated UKM for its plan to hold a Science Conclave in campus which she said would provide options for budding young scientists. With such schemes UKM should be able to work at the national level to spearhead the Nobelist Mindset workshop, Prof Asma said. Post doctoral candidates in new faculties should be able to assess their strengths and weaknesses and apply their self-knowledge to become more effective scientists. Studies show that students who took part in UKM’s Young Scientist Summer Camp at New York Academy of Sciences registered a massive increase in STEM interest – from 43% before taking part to 97% after completion. About 67% of them aspire to become Nobel laureates. The students were mostly from the MARA Junior Science Colleges (MRSM) and schools in FELDA settlements. “We are looking for balanced students. As liberal universities, you have to come up with balanced graduates,” she added. She said STEM education is not about teaching the subject but how the knowledge can be used to solve real-life problems; how to connect the knowledge learnt through formal training to provide creative and innovative solutions for the country’s industries. The Ungku Omar lecture series is named after Dr Ungku Omar bin Ungku Ahmad (1931-1969) the pioneering Malaysian scientific researcher and medical doctor who was the first Malay Director of The Institute of Medical research. Present at the lecture were Deputy Vice-Chancellor (Academic and International Affairs) Prof Ir Dr Riza Atiq Abdullah O.K. Rahmat and FST Dean Prof Dr Sahrim Haji Ahmad among others.